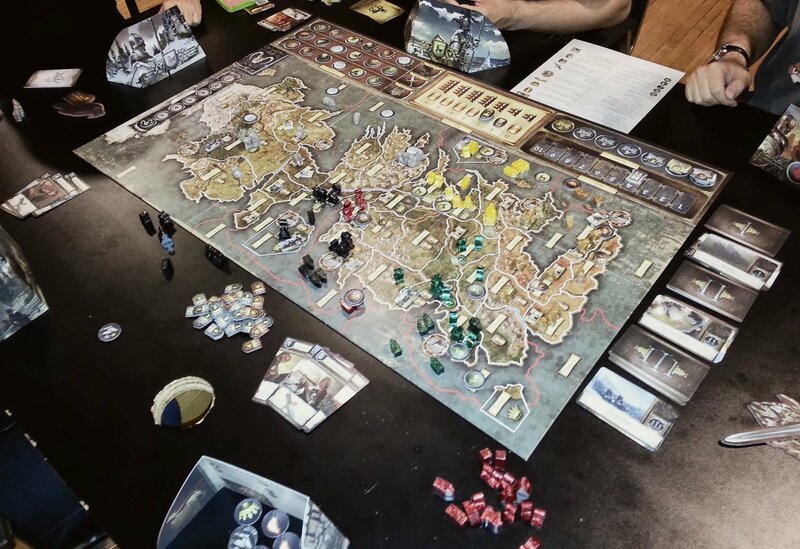 I finally had the chance last week to try out the 2nd edition of one of my favorite multiplayer wargames, A Game of Thrones, the Board Game, 2nd ed (Fantasy Flight Games), by Christian T. Petersen. I had played the first edition, along with the two expansions, many many times in the past and it was the favorite of two of the groups I played with, but for some reason, even though it’s been out for a while now, the new edition never hit the table. A Game of Thrones: The Board Game, 2nd Ed. The verdict? Wow, I really should have brought this out earlier. It is still one of the best “short” multiplayer wargame out there, but more on that later. Let me first go over the components and the rules. As with any Fantasy Flight Games, the quality of the components is great: the cardstock used for the cards and counters is just the right thickness and the map of Westeros is both clear and gorgeous. Unlike some of their other games, all the tokens and cards are actually needed, so while there seems to be less “stuff” than a Twilight Imperium or Arkham Horror, it is actually less overwhelming for a first time player and it takes a little less space to play. My only little nitpick is the marbled plastic used for the various combat units, which look kind of cheap. I would have preferred the wooden pieces of the previous edition. Not a big deal, but just something that caught my eye. The game is actually fairly simple, borrowing elements of both Dune (for combat) and Diplomacy (simultaneous secret order assignment). Each player takes the role of one of the houses from the first book (Baratheon, Lannister, Stark, Tyrell, Greyjoy, Martell) as they try to be the first to conquer 7 strongholds, and this before the 10th turn. The map of Westeros is broken down into different territories that will be familiar to fans of the books and tv show. A territory might show different icons, such as barrels (used for supply), crowns (used to gain influence), castles, strongholds (needed to win the game) and ports. Different tracks are also found on the board: a Wilding strength track; the three influence tracks (for the Iron Throne, the Valyrian Steel Blade and the Messenger Raven); a supply track; a victory point track and finally a turn track. On this map the players will move their different units: foot soldiers, knights, boats, and siege towers. Each player will take their shield (used to hide their order tokens and influence tokens), 5 of their influence tokens, units, combat cards and order token and place units and tokens on the various tracks according to the set up instruction in their shield. You start the game with very few units and will only be able to raise more when the Muster card comes up at the start of a turn (more on that later). Initial set up. All is quiet in the land. There are also 4 small decks of cards: the three Westeros decks and the Wilding deck. 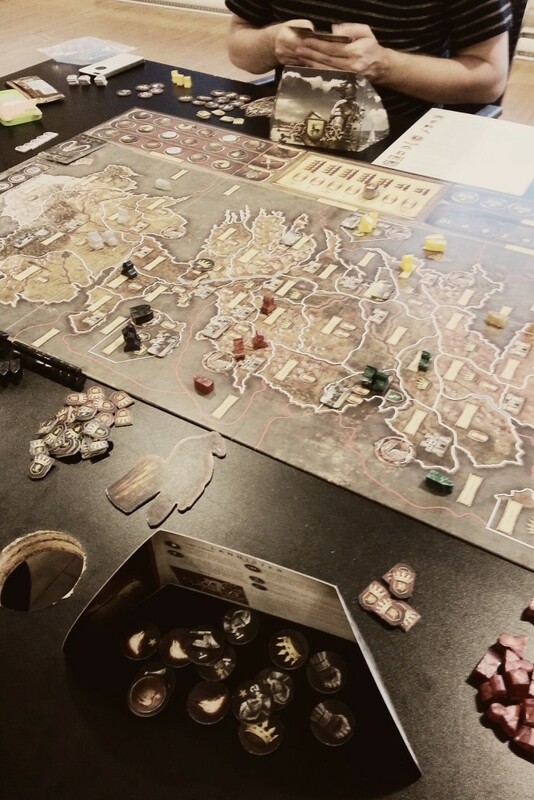 A turn is broken up into three distinct phase: The Westeros phase, where one card from each of the three Westeros decks will be turned over; the Planning phase, where the players will place their order tokens on territories which hold their units; and the Action phase where the various orders will take place. Before going into the phases proper, let me explain the importance of the three influence tracks and of the supply track. The three influence tracks indicate the order of each of the houses in three distinct ways: the Iron Throne indicates the turn order and allow the player in first place to hold the Iron Throne token, thus be able to break any non-combat ties; the Valyrian Steel Blade track indicates how ties are broken during combat (the closer to the top of the track, the more likely you’ll win ties) as well as give the player who is in first place on this track the Valyrian Steel Blade token, which confers a +1 in one single combat during a turn; and finally the Messenger Raven track, which bestow powerful “starred” orders to those who are high on the track as well as giving the player who is in first position the Messenger Raven token, which allows its wielder to change one order token once they have been revealed. Being high on each of these tracks confer a specific advantage and it’s hard to say which is better. It is a rare game where a player is able to be at the top of each track, but it is possible. The supply track is perhaps my favorite innovation of A Game of Thrones, the Board Game since it dictates how many armies the player is allowed to have at any given time. For example, if a House hold territories which have a total of two barrel icons, they can only have three armies in total: one army of three units, and two of two units. It can however have as many 1 unit armies as it wants. It can never move, retreat or muster units if such move would break this limit. This has for effect to keep players from creating massive armies and force them to spread out more. Taking a territory that holds only barrels is now important since it means that your armies will be able to grow, eventually. A turn starts with the Westeros phase. The top card from each of the three decks is turned over and players follow the instructions in order. The first deck holds Mustering, Supply or Throne of Blades cards. The Supply card simply means that the players count up how many barrel icons they currently have on the map and adjust their position on the Supply track. This might mean that the player has to reduce some of their armies or might give them the opportunity to make bigger armies. Reducing one’s army isn’t fun as the units go back into your supply. Mustering allows the player to bring new units onto the board, either at castles (1 point worth) or stronghold (2 points worth), as long as the player doesn’t break his Supply limits. The Throne of Blades card forces the holder of the Iron Throne token to take a decision between 3 choices, decision which will affect the upcoming turn. The second deck holds Clash of Kings, Game of Thrones and Dark Wings, Dark Words cards. The Clash of Kings card means that the order of the different influence tracks will change as the players will conduct a closed-fist bid for each track using their influence tokens. The Game of Thrones card gives each player one influence token for each Crown icon in the territories they hold. Dark Wings, Dark Words is exactly like the Throne of Blades cards, but this time it’s the owner of the Messenger Raven that has to choose. The last deck is the nasty one: it holds 5 different cards which will disallow the play of various order for the turn; a pair of Put to the Sword, which is the same as Throne of Blades, but for the owner of the Valyrian Steel Blade token to choose; and three Wilding Attacks cards, which triggers a Wilding attack. Should a Wilding icon be on a card, the current strength of the Wilding is increased on the Wilding Track. If they attack, the top card of the Wilding deck is revealed and the reward for the player who has put in the most influence is indicated, but only if the players put in enough influence to defeat the strength of the Wildings attack. Should not enough influence be put forward, then the player who put in the least will be strongly penalized, and the other players will also suffer a penalty. Again, any ties are broken by the player who holds the Iron Throne token. Since it is again a blind bid, it’s time to negotiate since losing this battle is usually a bad thing for everyone. The next phase, Planning, is quite simple: the players place one order token per territory in which they have units. In all, the players have 15 order tokens, broken down into 5 types: Raid, March, Defend, Support and Consolidate. Each of these orders have one token that is “starred”, which simply means that it is a more powerful version of said order, but is only usable if you’re high enough on the Messenger Raven track. Note that if you are too low on the track, then you only have 2 tokens of each kind. Raid allows the player to remove a Raid, Support or Consolidate token, with the starred version being able to remove a Defense token. Should the Raid token be used to remove a Consolidate toke, the player takes an Influence token from the other player. March is the only way to move units or to start a combat, with the starred order giving a bonus to the attack. All units only move one territory, except that land units can use a “sea bridge” ( a series of sea territories that have at least one ship of that House on them) to travel to another territory, and this no matter how far as long as the ends of the bridge touch both territories. Defend tokens add to the strength of a territory should it be attacked, with the starred token giving a bigger bonus. Support tokens allow the units in a territory to help the attack or defense of a territory that is touching it, and this no matter the side. The starred version gives a bonus to the support. This is the only order that can be used multiple times. Consolidate tokens allow the player to gain one influence token (+1 if there is a Crown icon present) or, if the starred version was used, allows for Mustering instead in this territory, using the local castle or the stronghold. The placement of the order tokens is done in secret, with the token being placed face down, one per territory where the player has units. Players are free to talk/negotiate when placing their tokens, but they are not allowed to show a placed token to another player. Once all tokens have been placed, we move on to the next phase. The Action phase starts with the players revealing all orders that have been placed, and then with the player who holds the Messenger Raven token changing one order token with an unplayed one. In turn order (from the Iron Throne track), players first resolve their Raid orders, one at a time, until all orders have been removed. Then, again one token per player, in turn order, the March orders are resolved. Any March order which result in units from two different Houses being in the same territory result immediately in a combat. Once all Marches and combat have been resolved, the Consolidate orders that are still on the map are resolved. The turn is then over, with all remaining orders being removed from the map and the Turn token being moved to the next turn. Combat is actually quite simple to resolve: add up the strength of the respective armies (1 point for footmen or boats; 2 points for knights; 4 points if attacking a castle or stronghold with a siege tower), call for allies if there are any Support token in nearby territories, add any bonus from the Defend or March token. No dice will be rolled, but rather one of the 7 combat cards will be played by each players, and this face down. These cards have a value from 0 to 4 and have special abilities that can change the battle. Some have, instead of an ability, either a sword (allows the removal of an enemy unit if you win the battle) or a tower (prevents the removal of a unit if you lose the battle). This is where even more bluff comes in: which card do you play, knowing that this card will then be unusable to you until you’ve played all 7 cards. Any ties are broken by the order on the Valyrian Steel Blade track. The play of these cards can change what looked like a defeat into a victory and this is where the real flavor from the books come in, since each of these cards represent a different character. And that’s the game. Seems like a lot of things to remember but in actuality, the game flows beautifully and there’s very little to fully remember. A lot of logistical problems will come up for the players, depending what House they are playing. The Lannister and the Greyjoy have a choice to make right away: do they ally, albeit temporarily, or do they try and eliminate each other. The Stark have to decide which side to come down on and when to come down, and so on for the other Houses. Lots of interesting choices, lots of space to make deals with each other and then betray at the right moment. What has changed since the first edition? A few little things, like adding the siege towers in the basic game and the same for ports. Redesigned map as well as minor changes in the distribution of forces. The two biggest changes may be the addition of Mustering with the starred Consolidate order, which now allows the players to get more troops on the board at any time instead of having to wait for the right card to come up. Also, the slight tweak to the playing of the combat cards: instead of taking back all your cards once you’ve played your 7th, you now have to leave that last card behind and only take back the first 6 cards you’ve played, which means most of the time you will not be seeing that card again for the rest of the game. I do however miss a few things from the previous edition’s expansions, mostly having to do with the two extra decks of combat cards as well as the two other maps: one for 6 players (the old game played with 5) and one for 4 players, which actually was quite vicious. The expansions brought tons of extra new rules that players could ignore and these are, for the most part, now integrated fully with the new game. There are, however, two small expansions that are out which serve a similar need, albeit with lots of small spoilers. A Dance with Dragons changes the Houses in the game and replaces the combat cards with new decks and A Feast for Crows, which has cards for a 4 players scenario, which also changes the victory conditions, replacing the taking of strongholds with victory point cards, each bearing a specific objective. Both are a nice, cheap way to get more replayability in a game that already has tons of replay value. The Supply rules along with the way new units come on the board adds a tension that is not seen enough in small wargames. All this, and it can be played to completion in under 4 hours, and this with new players. Add to this the new mini-expansions, and you got a lot of game for relatively not a lot of money. From what I read, you can play a game with A Feast for Crows in under 2 hours, which is great. We had 6 players at Ubisoft for this game, with Steph and me being the only two who had played the 1st edition. Nic, Julie, Steph and Benjamin hadn’t played, and only Benjamin hadn’t read the books or seen the tv show. The rules were picked-up quickly and we launched into the game. As the Lannisters, I over-extended myself too much trying to scare the Greyjoy away while the Starks were taking their time in the North, trying to see what was developing in the South. A quick pact between the Martells and the Tyrell meant that the Martells pretty much had an easy time in the deep South while the Tyrells decided to take on the Baratheon to pretty much a draw. After 5 turns, things didn’t look good for me as the Greyjoy pretty much chased me out of my territories, while the other Houses fought to a standstill throughout the land. Steph won with 5 strongholds, with the closest second getting only 2. Fun times were had by all and I’m pretty sure I can count on most players to give it a go again. Can’t wait for next time. 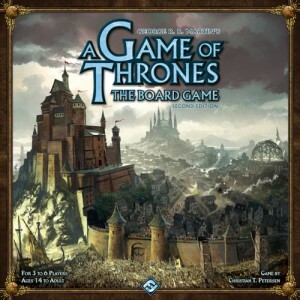 This entry was posted in Session Report and tagged A Game of Thrones on September 2, 2013 by TopDog. My first game ever played of GOT was against….. (drum rolling)…………You! At “le Valet de coeur” on a week night It must be around 10 years ago. I won because I manage to plead with Chantale (Former “Le Valet” employee and now with DUDE ditr. I think) that I was more miserable than you. She really was in a position of King Making me OR you. Although I like the game, as soon as you are a competent tactical player, and it is not that hard, I always felt that it all came down to convince the others players to let you win. For me DIPLOMACY is way more cutthroat and without all the “pretty” salad dressing of GOT. You’re doing only what really matter to the result; negociate, lie, cheat, cajole and bully. It’s way better to get rid of “friend” that you don’t really like…..héhéhéhéhéhé. -see you at a next Stack!